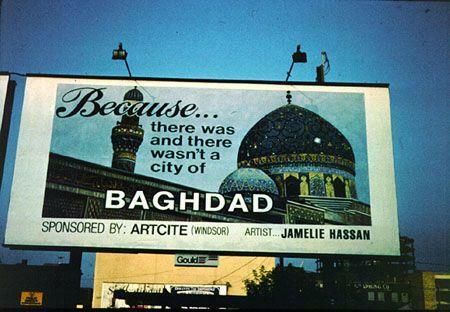 This work features a photograph Hassan took on her first visit to Baghdad, Iraq, in the late 1970s, when she studied Arabic at the University of Mustansyria. The photo shows the colourfully tiled dome and minaret of the Haidar Khan mosque, and the text evokes Arabia's literary traditions as exemplified in 1001 Nights. Event: In Control, billboard project by artists, organized by ARTCITE, Windsor, ON. Commissioner: Lorenzo Buj. Event: Outdoor Art Tour, an event organized by the Morris and Helen Belken Art Gallery, University of British Colombia, Vancouver, BC. Work located downtown Vancouver, at the corner of Richards and Pender Streets. Date : 1991 or 1992?